A flood expert is warning that vulnerable homeowners will have to be relocated to higher ground because the delivery of flood relief plans is too slow and too expensive. University of Limerick hydrologist Tony Cawley said dredging works, the construction of banks and raising roads would help areas at risk. But the Government's approach was too slow and held up by bureaucracy and environmental concerns, he added. Local authorities have struggled to put major flood schemes in place since last year's flooding. The group responsible for managing local authorities along the River Shannon is to develop a plan for dredging. Locals believe build-ups of sand, silt and debris are a root cause of flooding in communities along the Shannon. "Some schemes are 20 or 30 years in the mix but nothing has happened," said Mr Cawley. A €150m flood strategy for Cork was launched last week but is one of 19 OPW schemes running behind schedule. The Lower Lee scheme was expected to be completed in 2014 but was eventually broken up. Work is now expected to start late next year. Other Cork schemes and flood relief efforts in Clare, Dublin, Limerick, Galway, Mayo, Waterford and Wicklow are also running well beyond their expected delivery dates. It comes 12 months after the country's worst flooding caused millions of euro worth of damage. 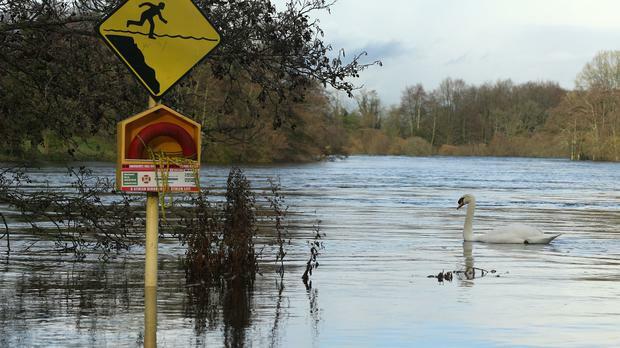 The OPW said the Shannon Flood Risk State Agency Co-ordination Working Group would develop a plan to dredge. "The group considers that maintenance works on the Shannon are essential to halt the deterioration of the river channel," said a spokeswoman. However, Mr Cawley believed too many schemes were held up by red tape. Pensioner Mikey Dunning, from Athlone, spent last Christmas manning pumps. He said: "What happened here last year had my heart broken and I couldn't go through that again." The OPW has committed to funding a scheme in Athlone. However, since last year, little work has been carried out to address issues along the Shannon. The council and the OPW have been constructing and improving flood defence works in the city. Funding of €1.8m was secured for flood relief and the OPW is preparing Draft Flood Risk Management Plans. The county council said it has planned and started work on more than 60 flood relief schemes. Most involve raising roads to above last winter's flood level. Three permanent flood defences are being provided and demountable defences are being procured at two locations. More than €500,000 has been spent on improvements and road-raising. An inflatable flood barrier has been purchased. Certain access roads have since been raised above flood level. There have been two planning applications in vulnerable areas. Clare County Council has completed a procurement process and has identified a consultant who would carry out a feasibility study with a view to identifying a sustainable solution to the historic flooding issues at Springfield and Clonlara, and has been seeking funding approval from the OPW to appoint the consultant. Clare County Council has also been preparing a Draft Clare County Development Plan 2017-2023 and is reviewing the zoning objectives for settlements across the county. Homeowners whose properties are damaged by extensive flooding this winter can apply to have their 2017 local property tax payment deferred. But they will not be entitled to revalue their house for a lower tax rate - even if their refurbishment bills total thousands of euro. The Revenue Commissioners said those seeking to defer next year's payment will be examined on a "case-by-case basis". It follows a similar announcement in January when property owners whose homes were flooded in late 2015 were invited to apply for a deferral of their payment for 2016. In total, deferrals were granted to 10 householders. Hundreds of homes across the midlands, west and south-west were damaged by floodwaters last winter. In a statement, Revenue said it recognises that events such as flooding may cause "challenges" for some taxpayers in meeting their tax payment obligations. Meanwhile, figures show there has been a 22pc rise in the number of residential property owners and tenants hoping to postpone payment of the tax. Some 6,500 extra households have applied to defer payment, bringing the total number of applicants to 36,125.